all divided by low motivation (M) multiplied by the need to take action (N). Sweet! All nonsense of course, but sweet! It was developed by some guy doing PR for a travel agency, so problems like turning weather, motivation and need into numbers didn't really arise. Neither did units of any kind, so it's not clear how a day of the year is supposed to come out. Also, Blue Monday is on the 16th this year regardless of the actual weather or your own debt and motivation. It cannot be changed. Partly because the equation doesn't actually work. protip: if you really do find yourself getting incredibly miserable, try externalising your pain by painting yourself blue and washing it off with a long, relaxing bath. That way you can drown your sorrows without recourse to alcoholism. But there are some creatures who are blue all year round. They can't do much about it either, yet they seem to be doing just fine! The Mountain Bluebird is the bluest of all the Bluebirds. Or the males are, anyway. 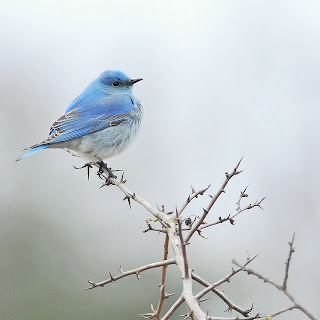 They live in western North America and are migratory, spending summer as far north as Alaska and escaping for the winter as far south as Mexico. They eat berries and insects and, perhaps because of just how woefully blue they are, even the prettiest of butterflies will fall prey to their ferocious beak and remorseless appetite. No, we will find no joy from the cruel and unfeeling Bluebird. ACHTUNG! 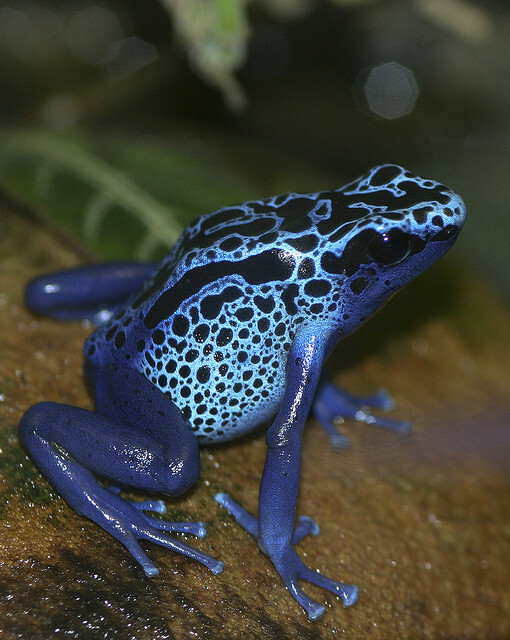 Dendrobates azureus is one bit of blue that could make you very unhappy indeed. If you come across a Blue Poison Dart Frog you should definitely be reevaluating the course of your life, or at least your walk. They live in parts of Brazil and Suriname, hopping around in the undergrowth and eating small insects. They are only 3 to 4.5 cm (an inch or 2) long, but those colours and bubbly patterns are extremely eye-catching. It is, of course, a warning to predators of their toxic skin glands, which produce alkaloids that can paralyse and even kill assailants. These toxins are gained from their diet, so they're harmless in captivity so long as you don't feed them poisonous insects. Males are territorial and call out to attract females, who will then have to physically fight amongst themselves to win their trophy husband. Quite the reversal! After mating, it's the male who looks after the eggs. It seems that The Blues are not one for tradition. I know essentially nothing about this beetle. 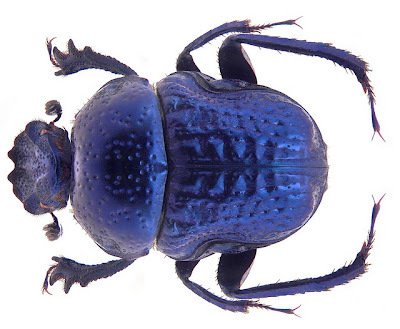 It's 1.2 cm (half inch) long, seems to come from India and it's wonderfully blue. It's a Scarab, so it's stout and powerful and it will probably eat decaying material of some sort, perhaps including dung. Who knew there was such a thing as Pimp My Dung Beetle? Pteraeolidia ianthina is a sea slug found in the Southwestern Pacific Ocean, from Hawaii through to the Philippines and all the way to Australia. They are covered in a kerfuffle of cerata, which are the tentacles on their back that increase surface area and help with breathing. This, along with a serpentine body that can reach some 20 cm (8 in) long gives it the appearance of a Chinese dragon. Do you remember how the Blue Sea Slug ate Portuguese Man o' Wars and stored the stinging cells for their own use? Well, this sea slug does something similar. It eats hydroids, which are close relatives of the Man o' War, some of whom live in symbiosis with photosynthesising miroorganisms. P. ianthina steals those microorganisms, stores them in their gut and makes use of the sugars they create from the Sun's light! Life is full of options when you're a sea slug! 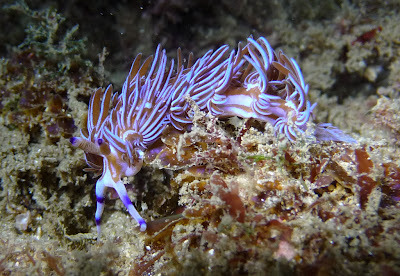 Especially a sea slug with The Blues. Poecilotheria metallica comes from southeastern India and Sri Lanka and was first discovered in a town called Gooty, which explains 20% of that cumbersome common name. They attain a legspan of around 15 to 20 cm (6 to 8 inches), which is fairly humble for a tarantula. They are arboreal, spending all their time up tall trees. They live in whatever holes they can find and lunge out at insects which they capture and eat. 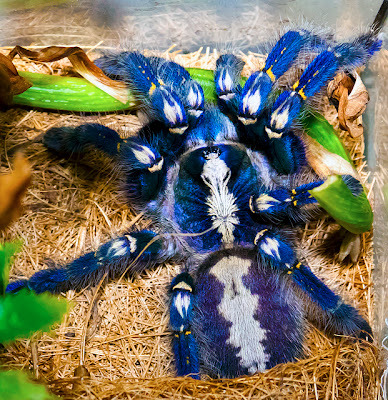 The Gooty Sapphire is popular amongst the kind of pet owners a spider can become popular amongst. They'll cost you a few hundred dollars, though. Females are in particular demand and can live for some 12 years, compared to the 3 or 4 of the male. When you buy The Blues, you want your money's worth. 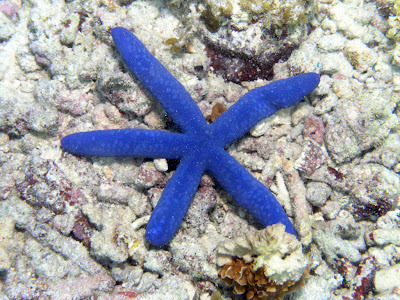 Linckia laevigata is a starfish from shallow, Indo-Pacific waters. They look a little different from your classic starfish, more like an asterisk or an experiment with sausages. One remarkable thing about them is their regenerative abilities, which has them dropping a limb to keep predators busy while the rest of the body makes its escape. Almost as if it really is a bundle of sausages. But it doesn't stop there! These starfish can also drop a limb to make a whole new starfish. The disembodied arm is known as a comet, and starts to grow four new arms to make up a new adult starfish. With reproduction like that, you know you're not gonna keep The Blues down for long! Some kind of millipede! It's blue! It's in the order Polydesmida, the flat-backed millipedes, named after the sticky out bits on the sides of the body. It's kind of like a long line of shoulder pads, as if it's power dressing in the 80s. It may also be poisonous - while not all Polydesmids secrete hydrogen cyanide, all the millipedes that do are Polydesmids. You'll have to go to Mexico to check for sure. Sounds like an honest way to earn some sick leave, to me. Anolis gorgonae is a small, beautiful and critically endangered anole from the island of Gorgona, off the coast of Colombia. 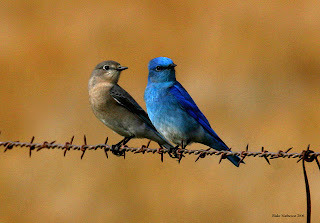 Both males and females are equally blue. Your classic anole would probably be green and the males would have a red dewlap under his throat. This is extended for courtship and communication but hidden away for camouflage when not in use. 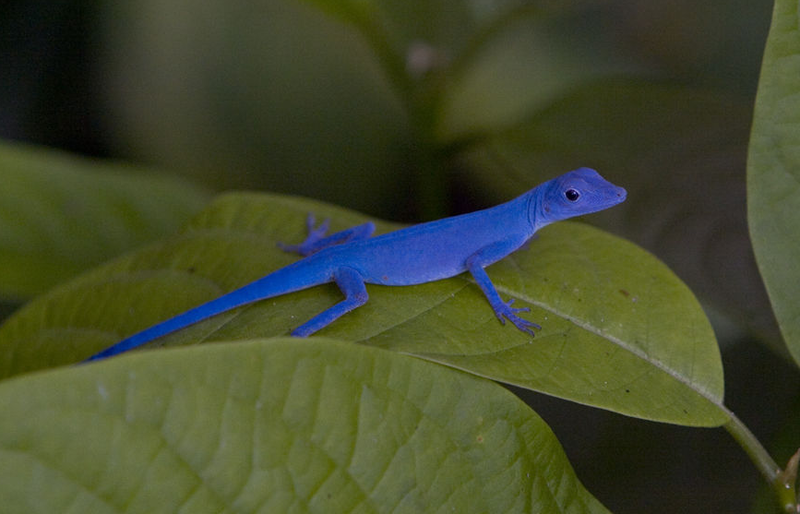 The Blue Anole has a white dewlap instead, which makes me think of the first flickering stars of a descending night. One wonders if this sliver of blue is a little over-confidant? They are endangered because of habitat destruction in their limited range, but it looks like any predator could see them a mile off. Perhaps these are the burdens The Blues demand of us all. 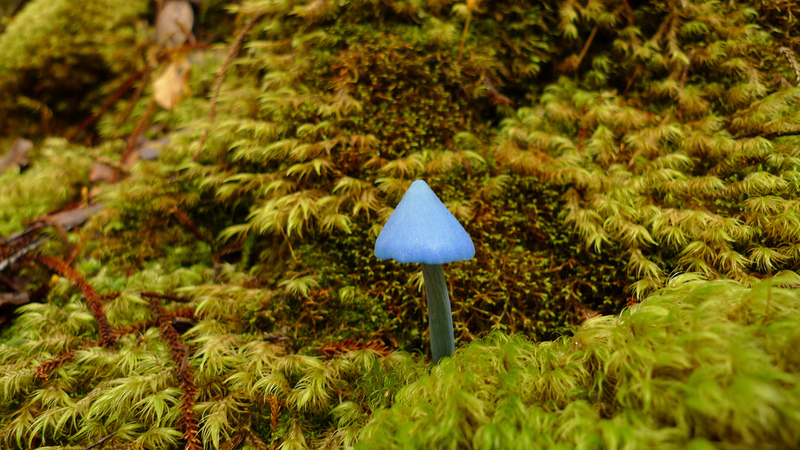 Entoloma hochstetteri is a pretty little mushroom from New Zealand and India. They get to about 5 cm (2 inches) in height and grow out of moss and leaf litter, speckling the ground with tiny droplets of the sky. Look at the picture above! Don't you just want to get in there and have a walk around? It's like a scene from Alice in Wonderland! 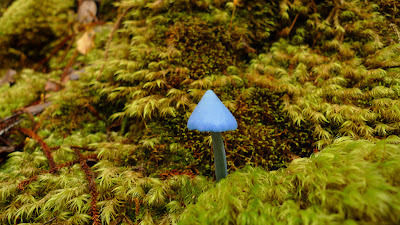 Noone seems to know if it's poisonous or... magical and it looks far too cute to eat, anyway. So if your Mondays start getting you down, remember that there'll be Blue Mushrooms over the White Cliffs of Dover. Just you wait and see. I know what you mean! Some of them are really spectacular. Any time you go on your round the world trip you can pop over and see if you can track them all down. Good luck and bring back pictures! I love that lizard! The world is a better place for its existence!